A sweet friend of mine, Meg Cook﻿, whom I recently purchased some fabulous art from, sat down with me to do a little brainstorming for my living room. While I love the french blue color of our wall, I find myself struggling to incorporate any non-neutral colors with it. I splurged a few weeks ago on a cowhide rug that I’M IN LOVE WITH and it gave me an itching to update the room a little bit…give it a little more “wow” factor. The bold rug was making everything around it look so boring in comparison. I felt myself hitting a wall and called her up for some advice. Her advice was to incorporate a burnt orange color in the room with accessories. 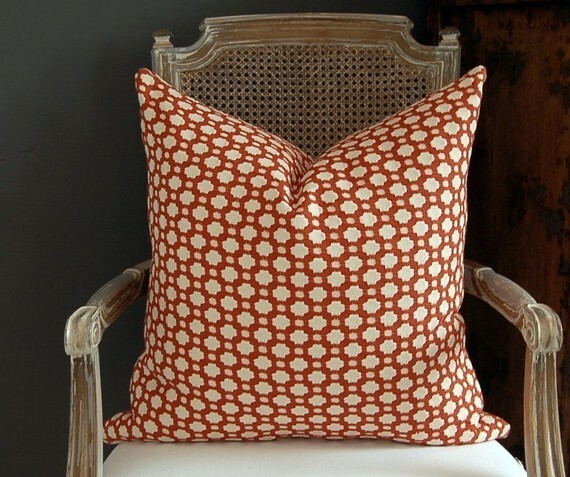 So far I’ve added two of these burnt orange pillows to my sofa. These are Celerie Kemble’s Betwixt pattern in “Spark” which is a lovely shade I’d call burnt orange. I love them! They add a pop of color and the pattern is transitional so it blends with both the modern and traditional elements in the room. I’m still working on finding a complementary fabric to do some additional pillows….but now I’ve set my sights on the wall above the sofa. My husband gave me an Mary Bryan New York skyline painting that now rests above the fire place opposite of this wall and I’m thinking I’d like a mirror to reflect that painting so that you notice it as soon as you walk in the room. The problem is a big mirror over the sofa is….well….boring…right? Right now the wall has four vintage car prints but the wall is large and looks sparse and I’m ready for a change. Which leads me to my inspiration photo. Isn’t is lovely?! 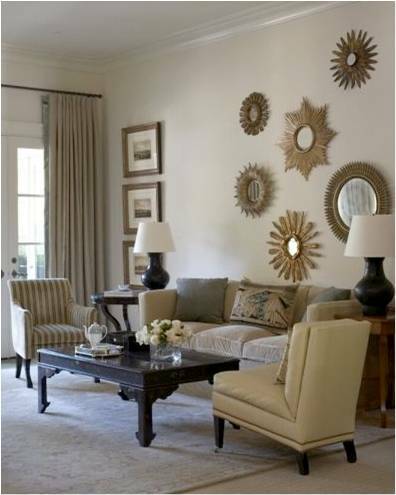 This living room is much more traditional than mine but I think the gallery of sunburst mirrors is a fun eclectic touch (even a tad modern) which is exactly what I’m looking to incorporate into my living room. I have two sunburst mirror in other rooms of the house that I can repurpose into the leaving room but I need at least three more and I’m hoping to find some vintage/antique ones to add in. And so the search begins….. 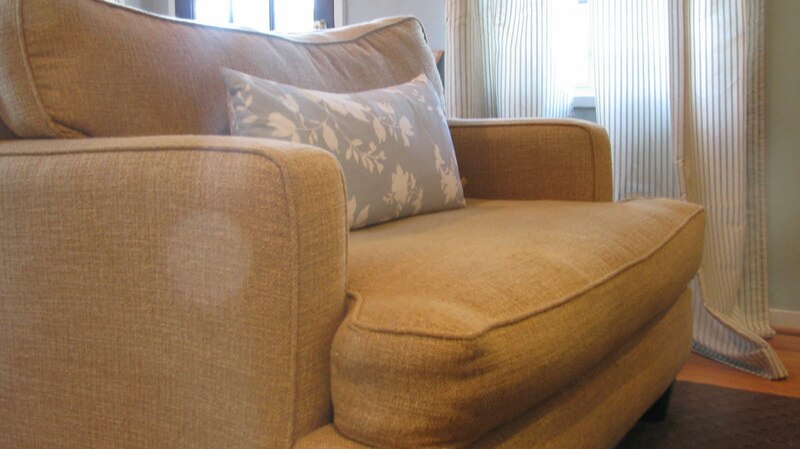 So we all know the easy “inside the box” ways to update a piece of seating furniture- throw some new accent pillows on it, a throw, or the ultimate…have it recovered. And since I just finished having a loveseat recovered for almost the same amount as the piece actually cost me, I will NOT be doing that again anytime soon. Don’t get me wrong- I would reupholster almost everything in my house if I had the skill, but I’m done paying someone else to do it. Anyway, I have a point, I really do…You see, I’m not a big fan of our sofa. It was purchased for me by my parents when I got my first apartment after college and it served it’s purpose well, but now…not so much my cup of tea. It’s small, not the most comfortable thing in the world, it’s microfiber, and I HATE the feet. I know…it’s a wierd thing to hate, but I truly do. The more you read this blog, the more you’ll find that I love just about anything from Restoration Hardware, especially the English Roll Arm Upholstery Collection and I am OBSESSED with this sofa. But since I was just complaing about paying to reupholster a loveseat, you can rightfully assume I won’t be purchasing it anytime soon. Not necessarily formal, but a little dressier than what I currently have. They’ll lift the sofa higher from the floor and add a little architectural interest. They come unfinished to I can stain them to match my coffee table perfectly. I’m very excited about this project as it doesn’t seem as though it will be too difficult but I am confident it will make a huge difference. The feet are priced well and won’t be too expensive of a project either. And every time I lust for that RH sofa, I can look at my new feet and be content….for the time being. I love The Nester‘s mantra that “it doesn’t have to be perfect to be beautiful.” I’m a total believer in that. These may not be the feet my sofa came with, but with a little effort, they will be beautiful in our home. I will update you once the feet are here and I’ve finished the project with a step by step “how I did it” in case you want to take on a similar project in your home. 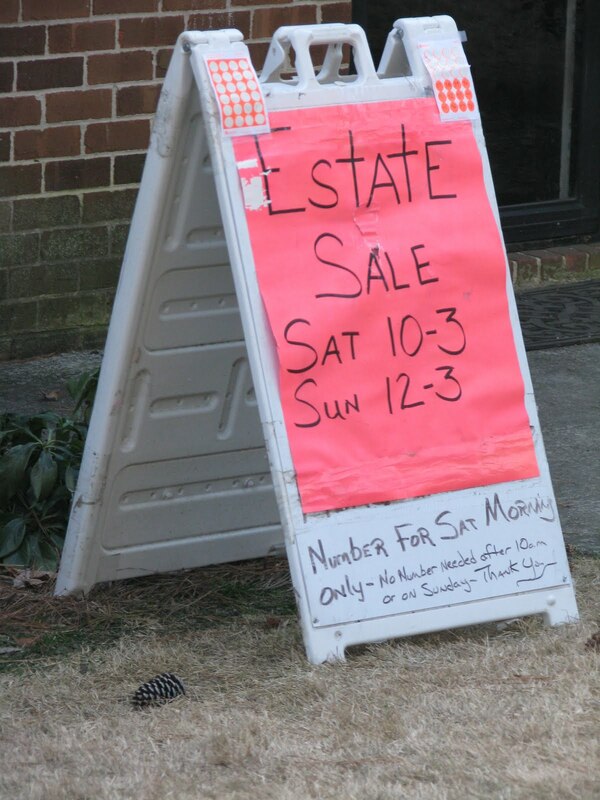 This weekend lent itself to some nice estate sale scavenging! Gusty found himself some tools which he has already used to trim (chop) down the overgrown crape myrtles in our front yard that the previous owner had let grow way beyond their intended height. And I found this beauty….. I LOVE THIS CHAIR. You can’t tell very well by the photo, but the fabric has a little bit of pink in it, making it less than perfect for the room, but it actually blends in our living room pretty well for the time being. 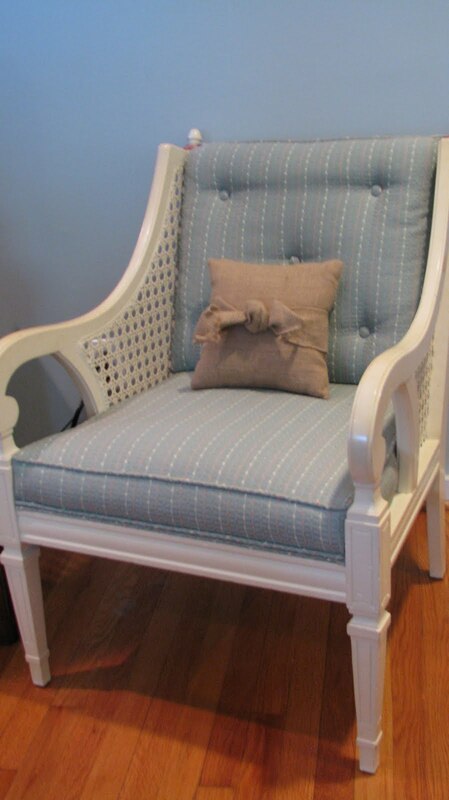 I know I want to upholster it, but I’m undecided on what type of fabric I want to use. Those were our only finds for the day, but I definitely consider the morning a success because I LOVE this chair. The shape and color of the frame (antique white) and the cane siding are just my style. So as promised, this post is the beginning of what I like to call “The House Tour.” I’ll be taking you room by room through our house highlighting the things I love, the things I’d like to change, and what projects I have going on (almost every room has at least one project at any one time). The living room has been my biggest focus as it is the room we use the most and the most public room of the house. When we bought the house, almost every room was painted a boring beige with an awful tinge of pink to it. We decided to paint the living room a calm grayish blue. We found the perfect shade of Behr called Rocky Mountain Sky. I think it turned out to be a great decision. It keeps the room from being your typical boring khaki or beige, but still keeps it neutral so that I’m not stuck in a strict color scheme. When you first walk into or living room, this window is to your right and probably one of the first things you see. Notice all the trees and no house lurking too close by. That is one thing we fell in love with about this house. It sits up on a steep hill and just about every room has view of nothing but tree tops and blue sky. And when the leaves have fallen in the fall and winter season, we have a decent little view of city lights. So, back to the window, we found two great dark brown leather club chairs at a discount store a few years ago that we originally used to stage Gusty’s house to sale before we got married. 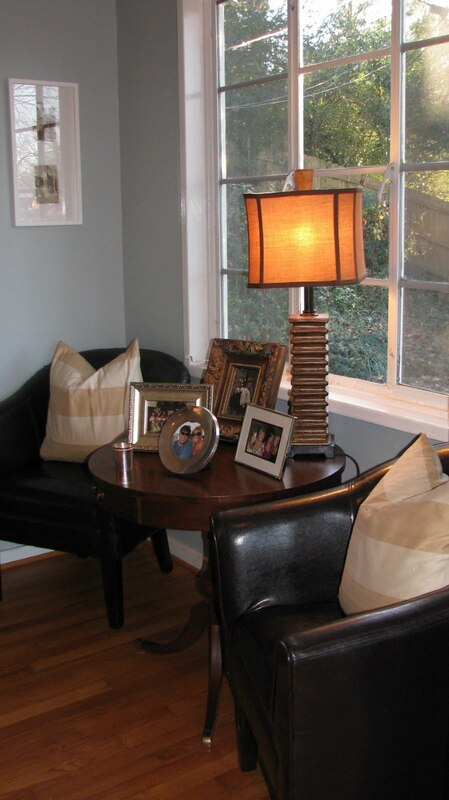 They’re pretty sturdy pieces and add a nice, modern flair to our predominantly vintage cottage. The drum table was a STEAL at (probably) around $60 from an auction at our local antique store…and when I say local, I mean within 5 minutes walking distance. We love walking over, grabbing a coffee, and browsing their eclectic inventory. I added a unique lamp I received as a wedding gift from some of my hostesses and a grouping of photos of family and friends. I do feel like this area is still a little bare because I do not have any treatments on the window. At our last house, I had only needed 4 panels for the living room windows and now can’t find any additional ones that match, so I’m on the lookout for all new drapes for the entire room. To the left, on the same wall as the front door, is this fireplace flanked by two large crank windows. This fireplace, while adding great architectural interest and symmetry to the room, has been a major problem for me. I LOVE a home with a fireplace, but I’ve hard a hard time deciding what to put on this one. 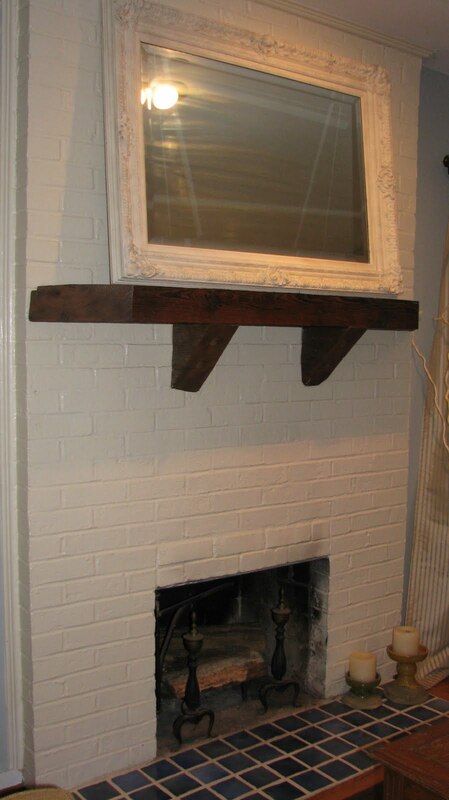 The mantle is too high, making the bottom half look naked, and it’s skinny, making it hard to layer objects on it. So for now, this HUGE antique white frame I snagged from a yard sale for about $30 lives here. I’d love to give the fireplace a whole new makeover with a new mantle, but there are too many projects higher on my priority list right now. 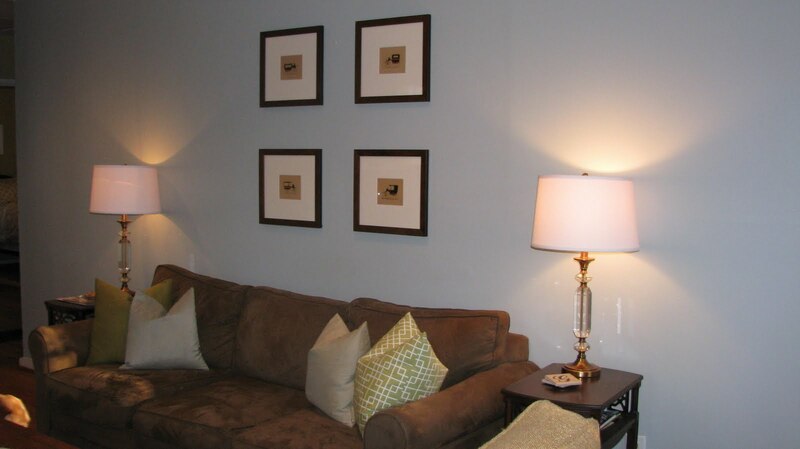 Opposite of the fireplace (and the front door) is the focal wall that houses our sofa. I recently purchased some great vintage prints of early primitive cars on Etsy. They were pretty inexpensive, but the custom framing was a fairly pricey project. Here’s an up-close look at them. I absolutely love the outcome. 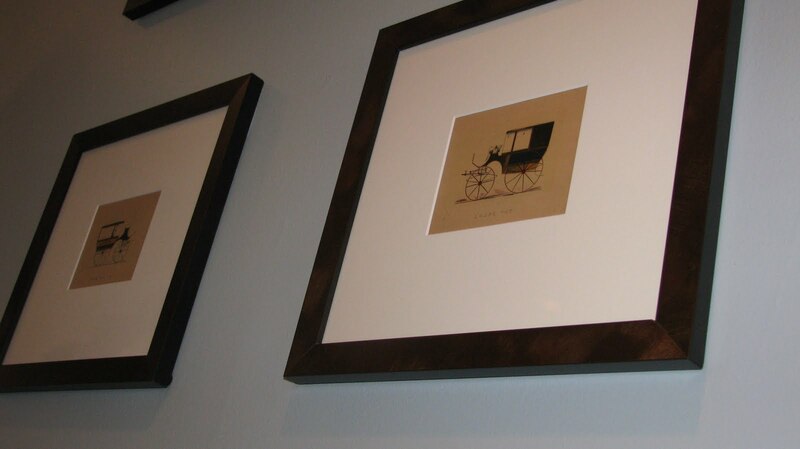 The matting is ivory and the frames are beautiful brushed copper that takes on several different shades depending on the lighting and angle. The mirror over the mantle was originally over the sofa, but I felt like it was super girly and wanted something a little more gender-neutral for the focus wall (considering between the dogs and I, poor Gusty is the only man in the house). I think they add a great vintage touch and are definitely conversation starters as they actually have the name of the models hand written on them. So, besides the two leather club chairs, the sofa, and the new estate sale find, I have one other piece of seating furniture which is the loveseat. We originally purchased it in a beautiful cream color, but should have known that was a poor decision considering the two dogs. It wasn’t long (maybe 6 months) before it started looking super rough and worn, so we decided to have it reupholstered. There are very few things I’d like to learn to do more than conquering sewing and upholstery, but I just haven’t gotten around to it yet….Hey! I’m only 24! I’ve got plenty of time, right? We chose a great fabric from Waverly called Pascal-Bourbon. It’s got a heavy texture/weave that’s very durable, but still soft and comfortable. It’s got a little bit of a deeper color than this photo shows, making it much easier to keep clean. We are definitely enjoying actually sitting on this piece now without constantly worrying about getting it filthy! So, these are the major parts of our living room. We only have one common living area, as opposed to a den + a formal living room, so my focus here is to make it a comfortable, cozy livable space with quality pieces (at bargain, budget prices). You may have noticed I left out one of the most crucial pieces of a living room: the coffee/cocktail table. Ah, do not fret, multitudes of people who ready this blog! That will be my next post! In the meantime, I’d love comments and suggestions on the space (especially my sad fireplace…it’s really got me stumped! ).